CSIRO is using integrated urban water management systems to demonstrate how cities can respond to drivers such as climate change, population growth and rising demands on regional resources such as water and energy through sustainable urban development pathways. Two projects were completed in the coastal cities of Can Tho, Vietnam, and Makassar, Indonesia. Makassar, which is considered very strategic for Indonesia as it represents the gateway to the eastern regions, is particularly vulnerable to climate change impacts such as coastal inundation. 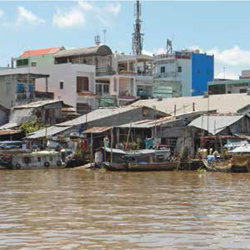 Can Tho, located in the Mekong Delta, is already facing challenges in terms of water and wastewater provisions and its problems with water quality and quantity will be exacerbated by climate change. The projects’ specific focus was climate adaptation in the context of providing water and wastewater services. Both cities are expected to grow rapidly and considerably in the coming years and significant infrastructure investment is planned to support the fast-growing population. There is considerable risk that investment currently proposed is poorly designed to adapt to climate change. We engaged with in-country policymakers, urban managers and researchers to facilitate the development of practical knowledge that they can use to assess and guide investment options. engaged communities through existing forums to build people’s understanding of climate change impacts and the adaptation required.